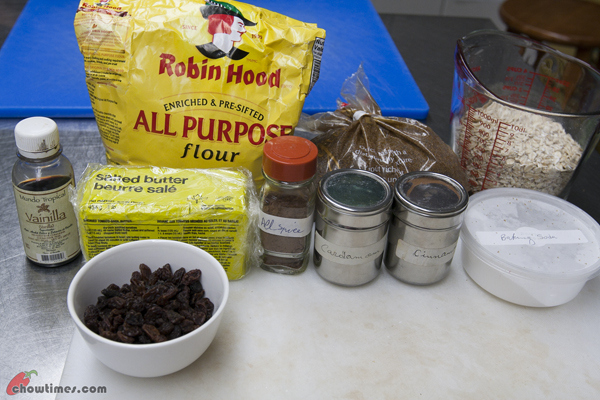 This Raisin and Spice Oatmeal Cookies ties up the spice theme in the Gilmore Park Church community kitchen. 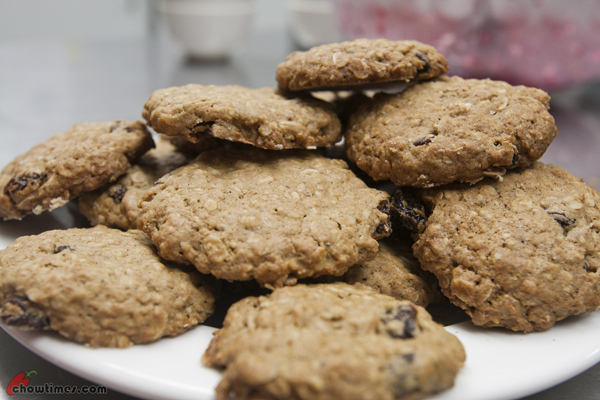 Besides the benefit of spices, this cookie also has the goodness from oatmeal. 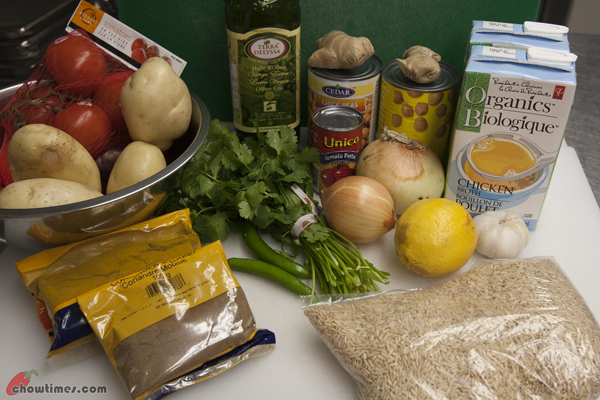 Here is an excerpt that Minoo shared in the community kitchen on the reasons to eat oatmeal. Many studies show that eating oatmeal may help lower cholesterol and reduce the risk of heart disease. The soluble fiber in oats helps remove LDL or bad cholesterol, while maintaining the good cholesterol that your body needs. In January 1997, the Food and Drug Administration announced that oatmeal could carry a label claiming it may reduce the risk of heart disease when combined with a low-fat diet. The soluble fiber in oatmeal absorbs a considerable amount of water which significantly slows down your digestive process. The result is that you’ll feel full longer, i.e. oatmeal can help you control your weight. With the exception of certain flavoured varieties, the oats found in your grocery stores are 100% natural. If you look at the ingredients on a canister of rolled oats, you will usually see only one ingredients… rolled oats. According to recent studies, a diet that includes oatmeal may help reduce high blood pressure. The reduction is linked to the increase in soluble fiber provided by oatmeal. Oats contain more soluble fiber than whole wheat, rice or corn. Oatmeal contains a wide array of vitamins, minerals and antioxidants and is a good source of protein, complex carbohydrates and iron. Oatmeal is quick and convenient. Every type of oatmeal can be prepared in a microwave oven. Even when cooked on the stovetop, both old-fashioned and quick oats can usually be made in less than 10 minutes. And what about instant oatmeal… a hot breakfast in under a minute. Minoo served a side dish of Pomegranate Salad with Nuts along with the Chickpea Curry and Moroccan Carrot Soup. 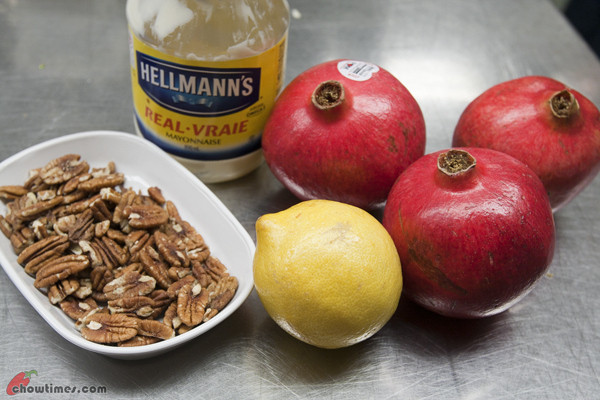 Pomegranate is in season in late fall. 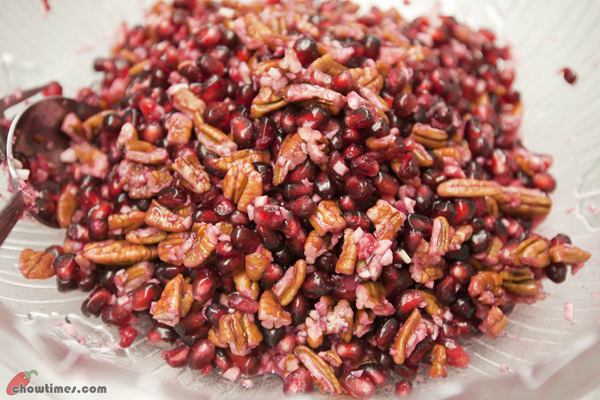 Minoo’s daughter loves this salad and she must have it when pomegranate is in season. Pomegranate is rich in Vitamin C. It is a good source of vitamin B5, potassium and polyphenols such as tannins and flavonoids. 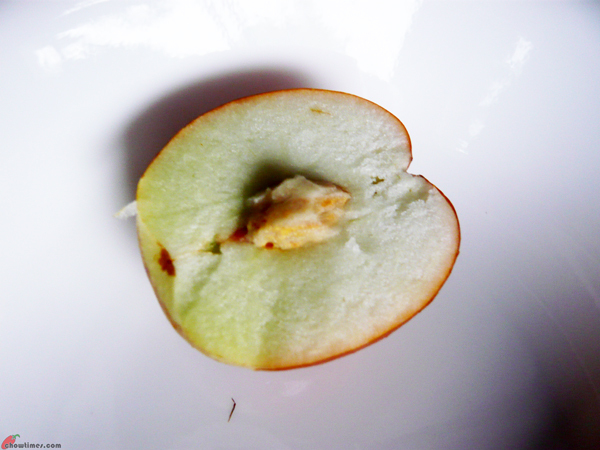 It is also rich in fiber which is entirely contained in the edible seeds which is also a supply of unsaturated oils. P/S: You may add arugula or lettuce to this salad as well. For the main course, Minoo prepared a Chickpea Curry for the spice theme. This is also known as Chana Masala in the Indian culinary term. This vegetarian curry is loaded with spices like garam masala, cumin and coriander. 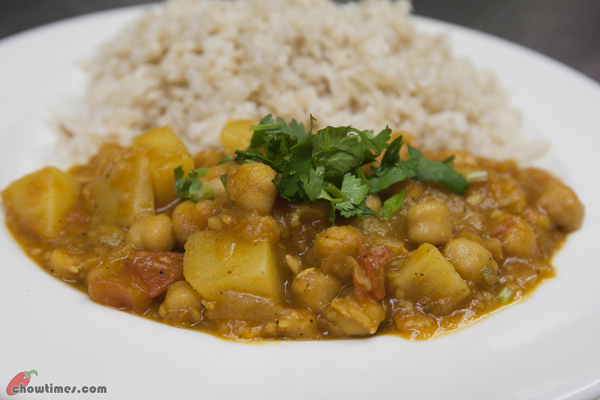 Minoo served this Chickpea Curry with brown rice. For this kitchen in the Gilmore Park Church, Minoo chosed a theme of spice. Here is an excerpt that Minoo shared with us. Spices do more than make food taste great. Recent reseach is showing that spices can promote health and well being through a series of actions that are anti-aging and inhibiting of degenerative disease. The vegetarian diet so often associated with good health and lack of disease relies heavily on the use of spice. But you dont have to be a vegetarian to gain the amazing health benefits these inexpensive flavour enhancers have to offer. Add some chili pepper, cumin or turmeric to mashed potatoes or rice. Sprinkle marjoram or rosemary on your salads. Any way you do it, adding spice means adding a wealth of health benefits. 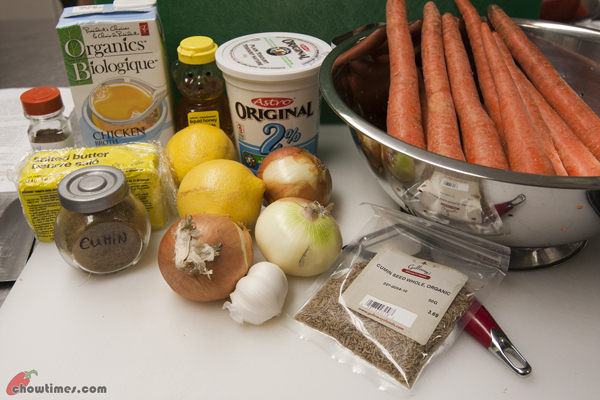 Spices have more antioxidant power, measure for measure, than fruits and vegetables. Antioxidants helps prevent cancer, Alzheimer’s disease, heart disease, and premature aging. 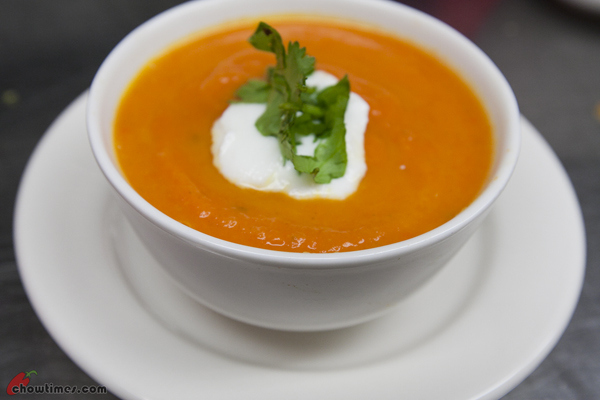 This Moroccan Carrot Soup has a punch of flavour. The addition of lemon juice gives it a much depth of flavour. Complete Disclosure: This meal is complimentary from coupons from Vancover Slop. Nanzaro and I had lunch at Nando’s on a Sunday afternoon. Arkensen was doing his homework and he asked for take out for his lunch. 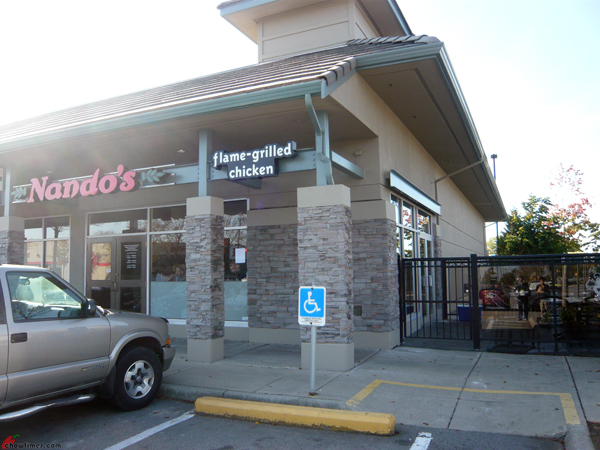 The Nando’s that we visited is the one in Coppersmith, where Canadian Tire is. There are plenty of parking here. 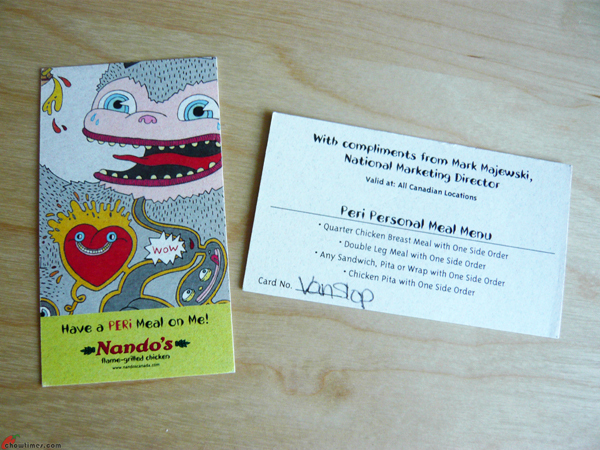 The reason we picked Nando’s for lunch is because I still have 3 complimentary coupons from Vancouver Slop during the launching of his new blog or something like that. We were there early as usual. 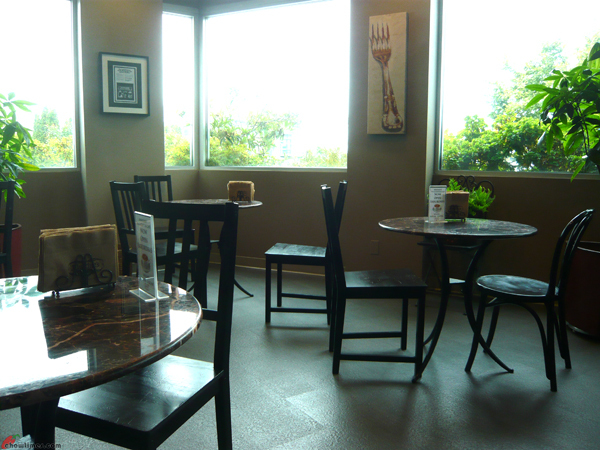 So, there is no wait and plenty of tables to choose from. By around 1 PM, the place is full. 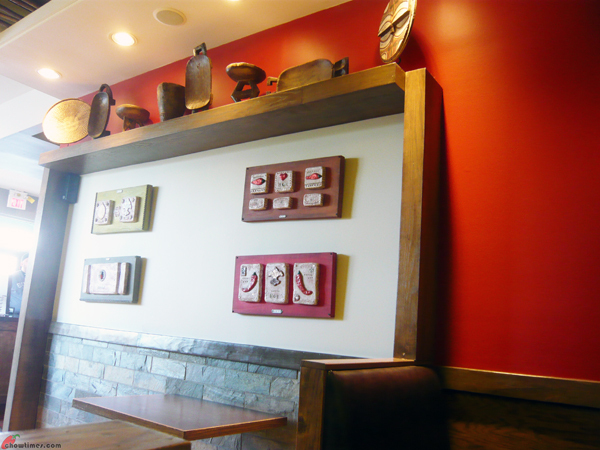 The decoration in Nando’s is warm and rustic. 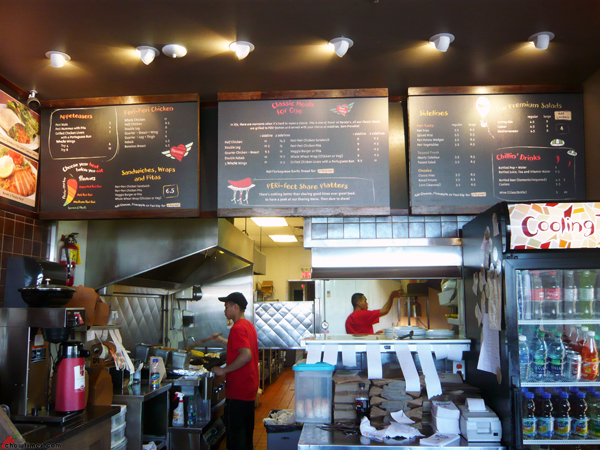 You order at the counter and paid for your food there. 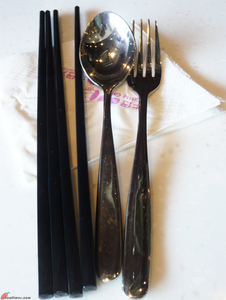 You will be handed your utensils and a number stand. You are free to pick any table. 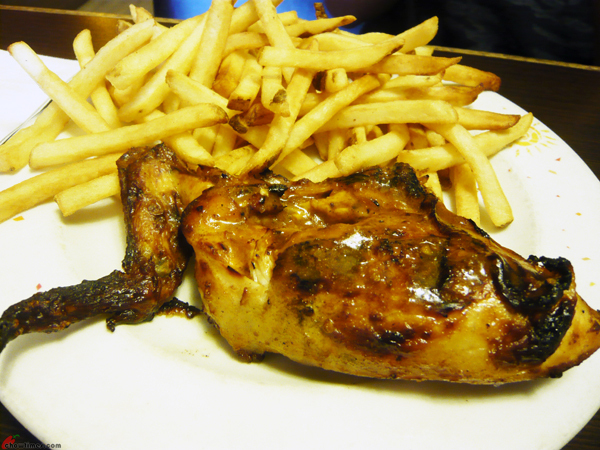 The server will bring the food to your table. 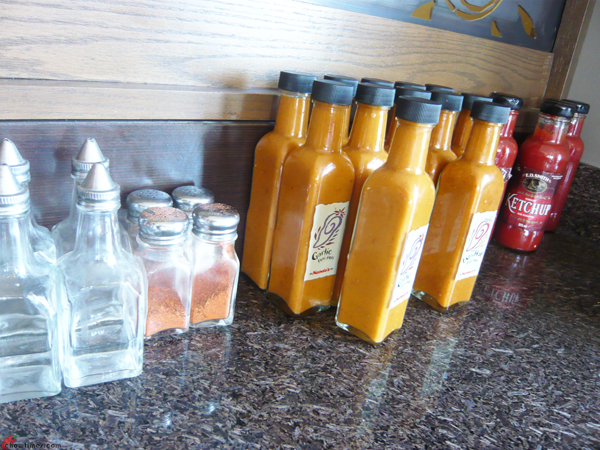 You can help yourself with any condiments on the condiment table. 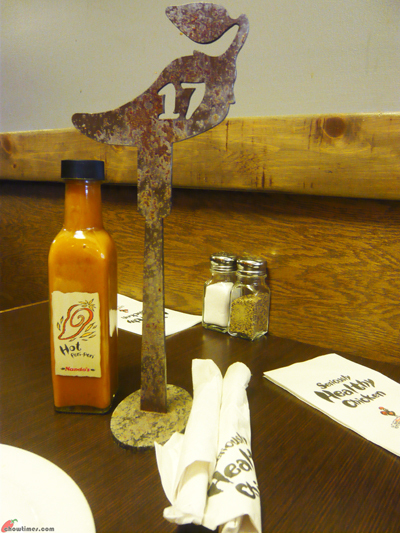 Of course, Nanzaro picked the Peri-peri hot sauce. 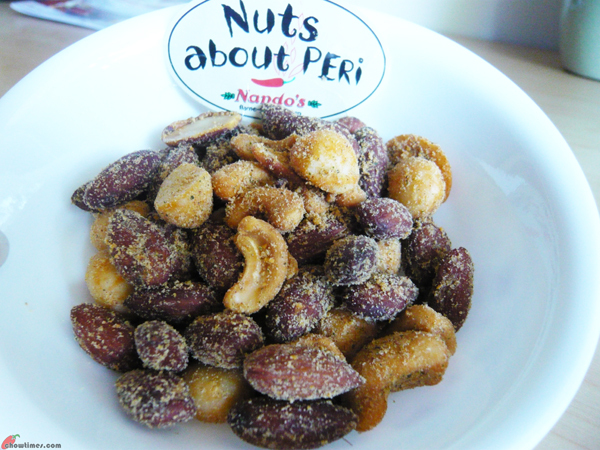 I ordered a Peri Nuts to munch while waiting for our main meal. 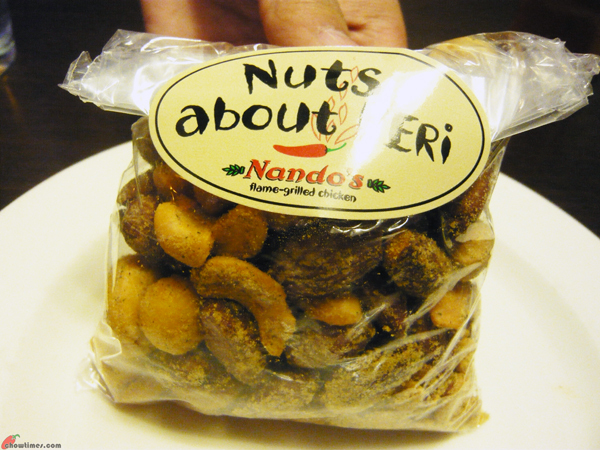 A small bag of the Peri Nuts costs $3. It consists of almond, cashew nut and macadamia nut and coated with some tangy, smoky and savory seasonings. Nanzaro commented some of the nuts are quite salty when there is too much seasoning on them. I found that they are quite addictive as I finished the leftovers that we brought home. Polly and I met again for our sweet treats. 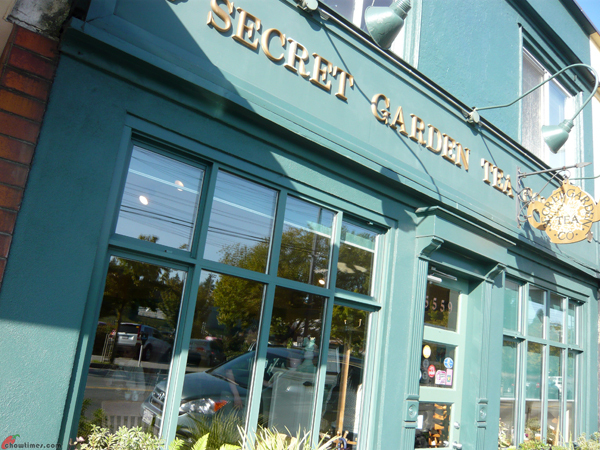 We went to the Secret Garden Tea in Kerrisdale, Vancouver. 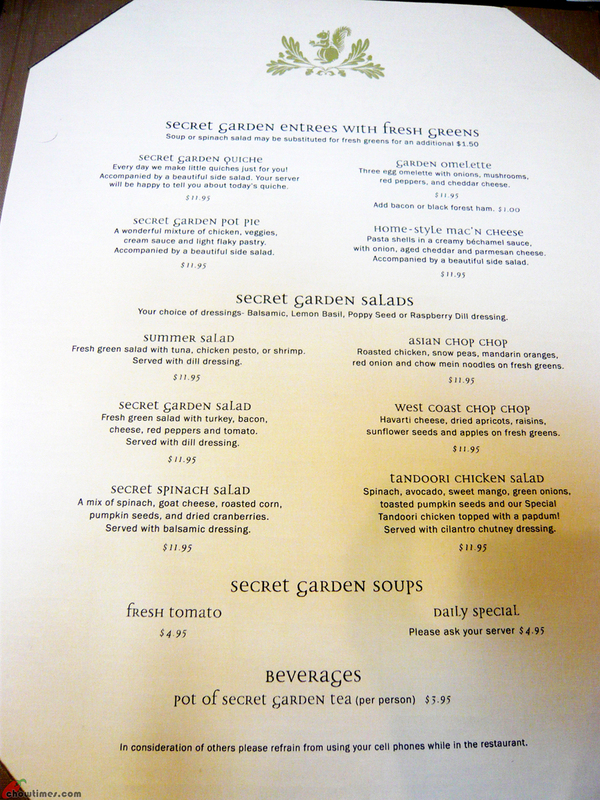 The Secret Garden Tea Company is a family-owned business run by sisters-in-law Kathy and Erin Wyder. It was established in 1995, inspired by Kathy’s grandmother, Gammy Bentail. We sat at the inner section which is more quiet. The front section was buzzing with customers. 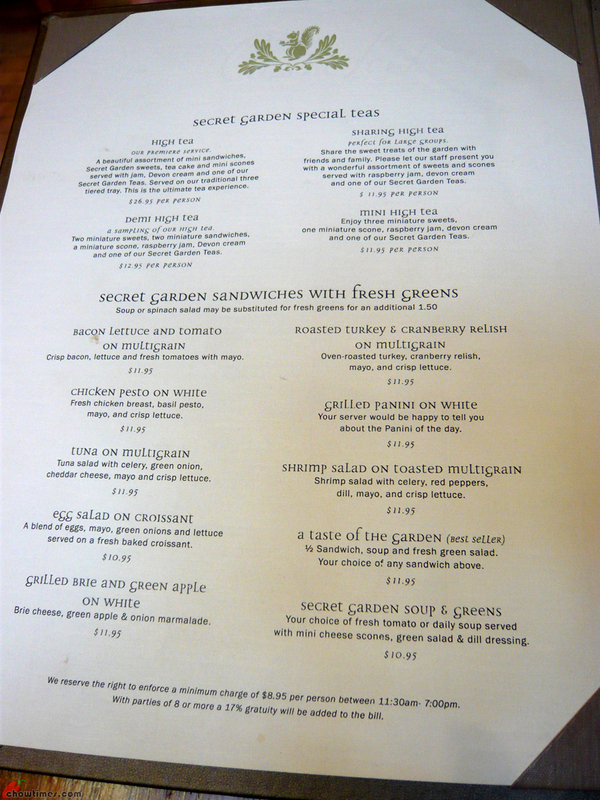 The Secret Garden Tea Company’s mission is to offer moments of comfort, beauty and joy in an elegant yet comfortable setting, beautiful eats, and a good cup of tea. 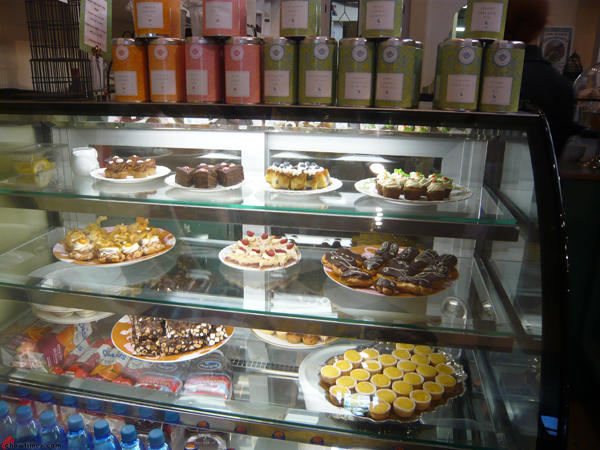 We were ecstatic when we saw the sweet treats on display. We almost wanted to order one of each of the miniature sweets to try. When we asked the server the price of the miniature sweets and our intention to get one of each, she suggested us to try one of the high tea menu instead. The miniature sweets is $1.95 each. You may click on the menu to have a larger view. 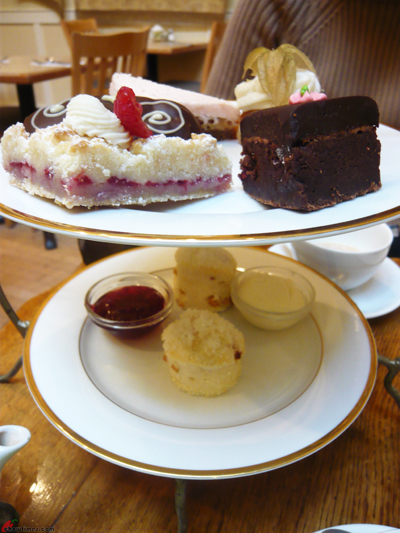 The server was very helpful in explaining to us the difference between the high tea options. It’s another weekend dining out with my kids. This time, Arkensen refused to come out with us. So, it’s just Nanzaro and me. 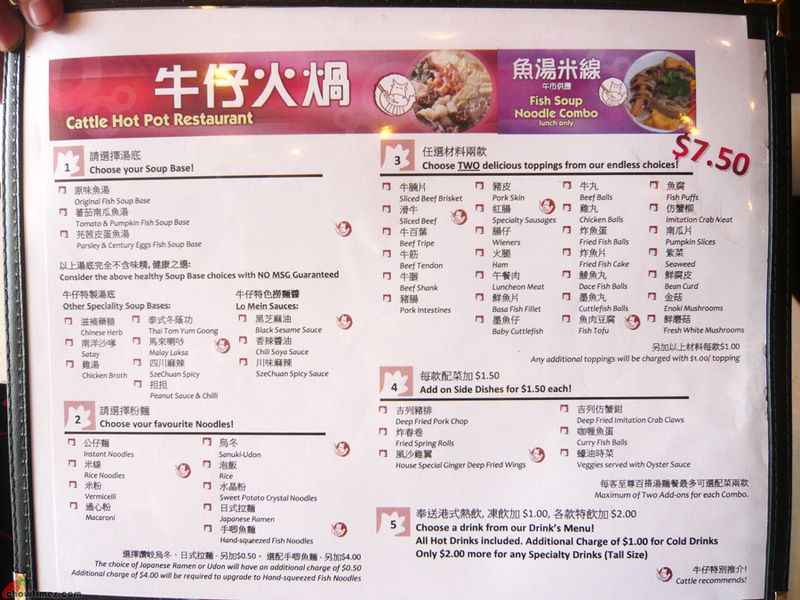 We went to Cattle Hot Pot Restaurant on Alexandra Road. It was empty when we were there just before noon. At that time, there was a wait line in Kam Do Restaurant and Bakery which located just next door. Cattle Hot Pot is a hot pot restaurant. 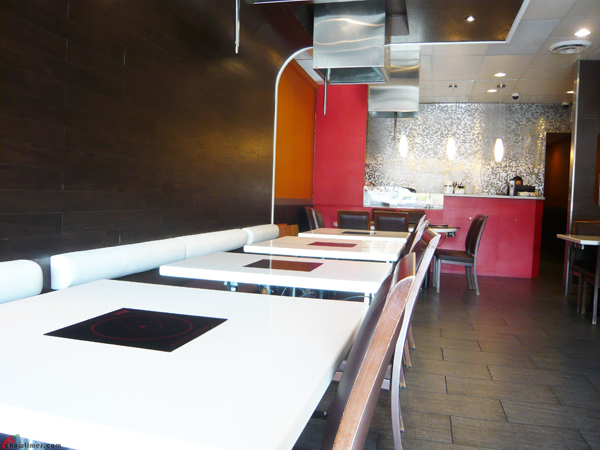 You can see that each table is equipped with built-in burner. But we were not here for hot pot. 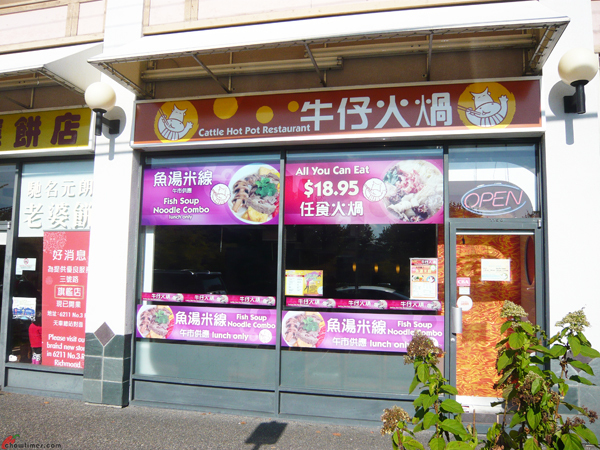 Cattle Hot Pot is affiliated with Cattle Cafe across the road. 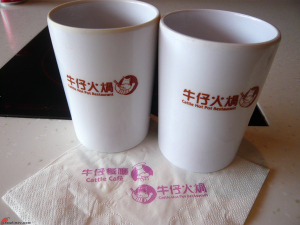 You can see both restaurants printed on the napkin. 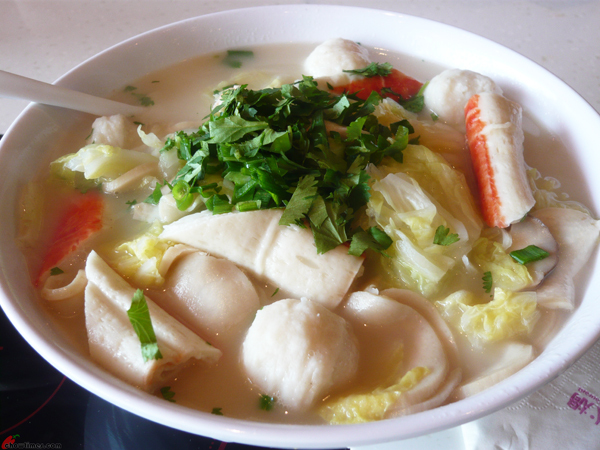 Cattle Hot Pot now serves Fish Soup Noodle Combo and Cattle Meals during lunch hour. You can click on the menu to have a better view. 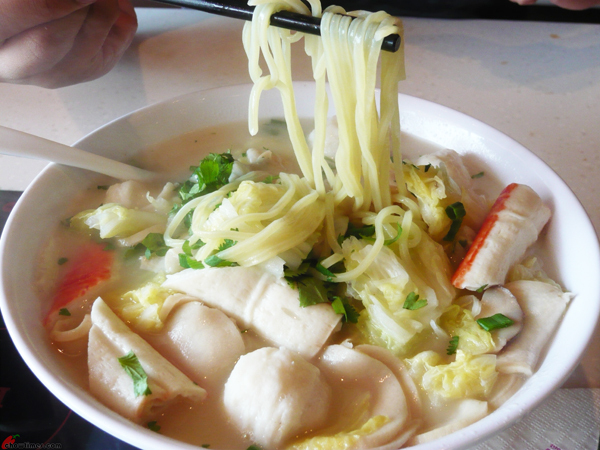 Nanzaro opted for their Fish Soup Noodle Combo. The combo is $7.50 and it includes a drink. 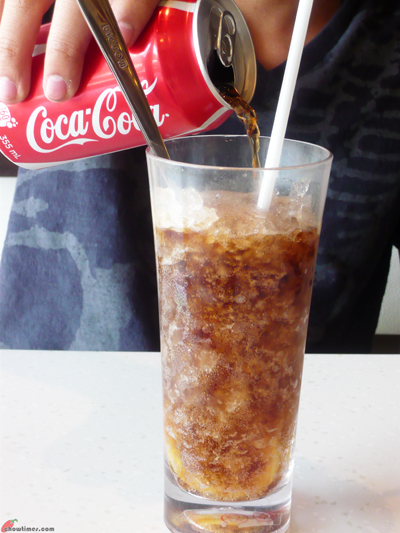 Nanzaro had lemon Coke for his drink. 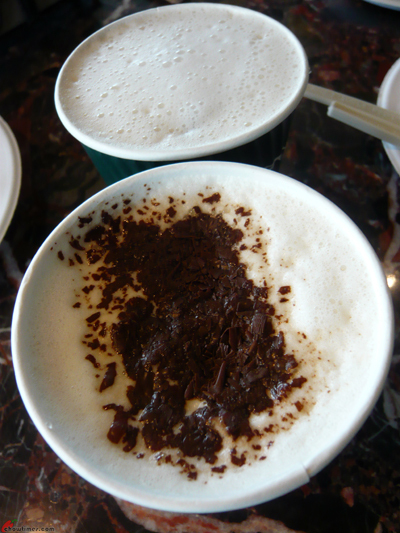 Like most Hong Kong style cafe, there is an extra dollar charge for cold drink. 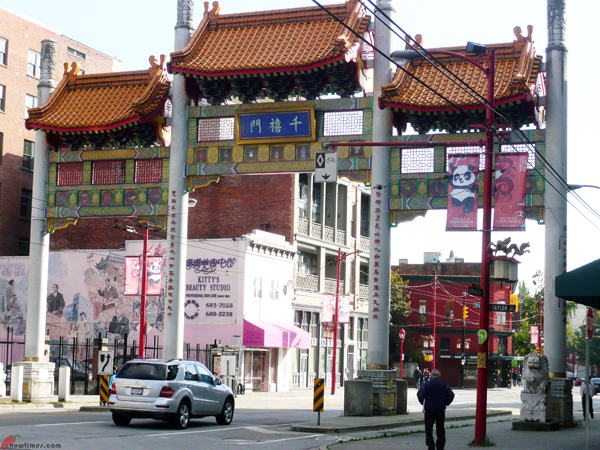 When Lorna and I went to Chinatown Vancouver to buy red dates, we did a little exploration of Chinatown. 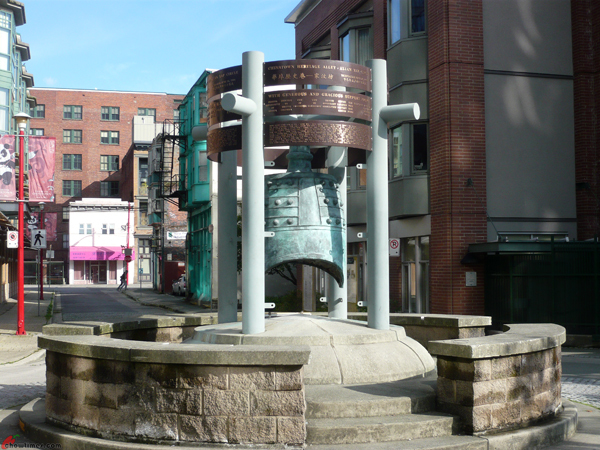 The Vancouver Chinatown Millennium Gate is the most prominent structure in Chinatown. Lorna told me that the Chinese characters on the gate was written by a famous calligrapher whose is a friend of her. 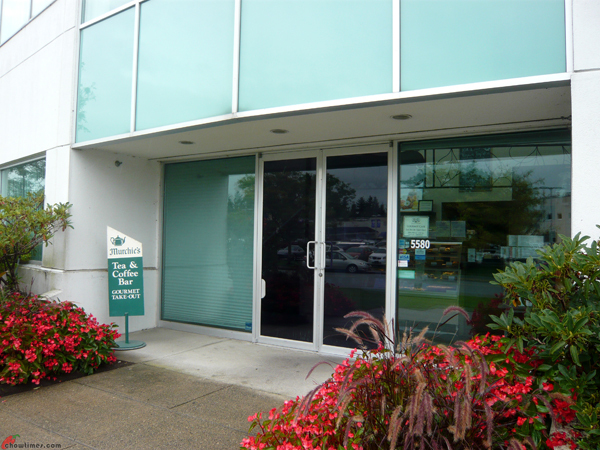 We also visited the China Abacus at Keefer Street near Taylor. 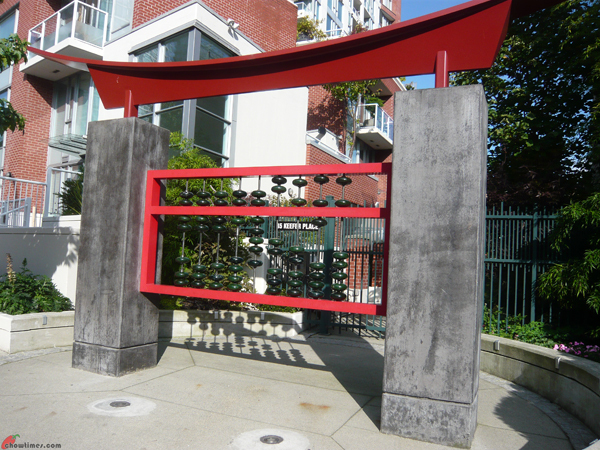 It is a large abacus artwork with stylized beads of British Columbia jade. I remembered my father have an abacus at home. I never learned how to use it. I’m always amazed when I see people in Chinese stores using it as their fingers danced around the beads. We also took a walk in the historical alley where Shanghai Alley, Suzhou Alley and Guangzhou Alley is. 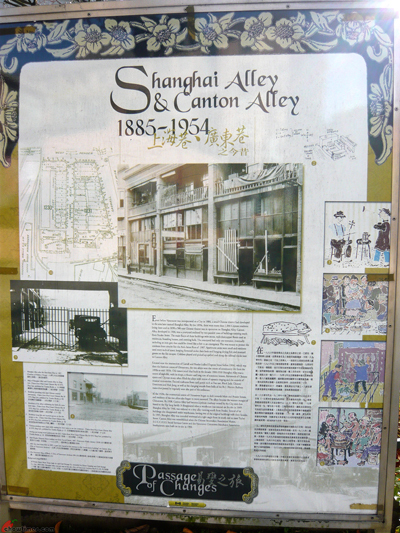 There were a number of huge posters which showcase the history of Chinatown in the alley. If you are interested in history, take your time to read the posters. In the historical alley, there is a West Han Dynasty Bell called Yong Bell. 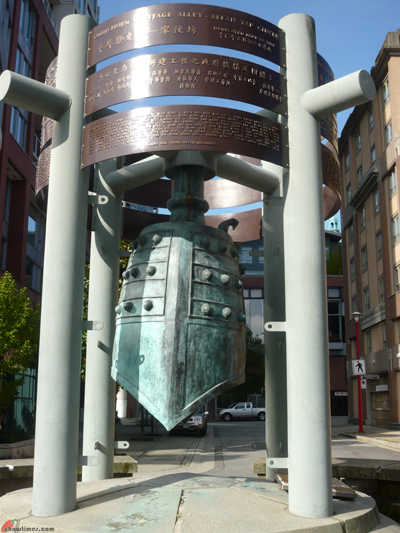 The bell was a gift from the City of Guangzhou to the city of Vancouver in honour of the 15th anniversary of the twinning to the two cities. When I was doing my groceries shopping at Langley Farm Market, I saw something new to me. It’s labeled as winter dates (in English). I bought some to try. The winter date is just 99cents per pound. I think they are fresh red dates because they tasted like the dried red dates. 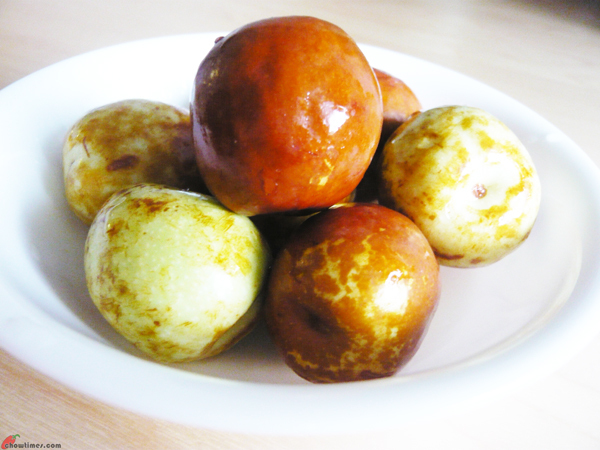 Red dates are also known as Jujube. I noticed that the more brown they are, the sweeter they are. However, when I visited the Richmond Public Market sometime later, I saw the same fruit labeled as Honey Dates (in Chinese). Anyone can clarify the difference in the name? Polly brought me to Murchie’s Tea & Coffee in the Richmond Automall for our ladies’ meet. I have no idea that such a place exist as I only go to the ring road in the automall. 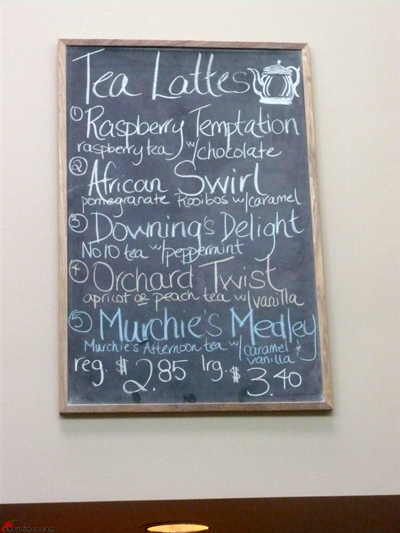 Murchie’s Tea & Coffee is located in the Crestwood Commerce Center across the Lexus dealership. 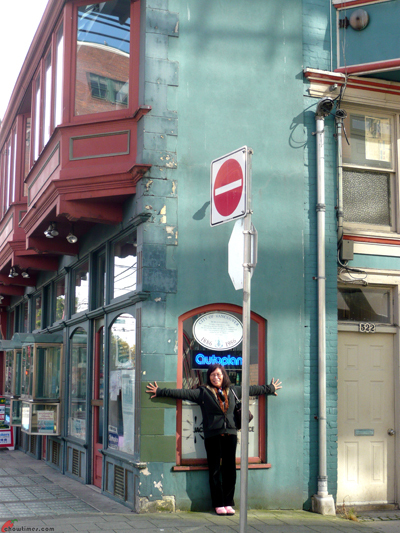 It is next to the Boston Pizza. 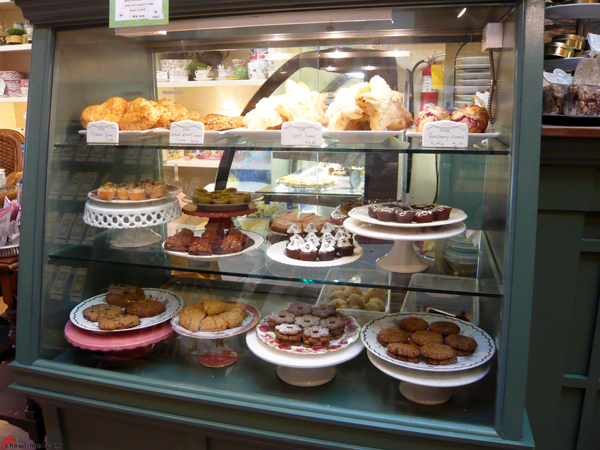 Murchie’s Tea & Coffee mainly caters for the surrounding business. 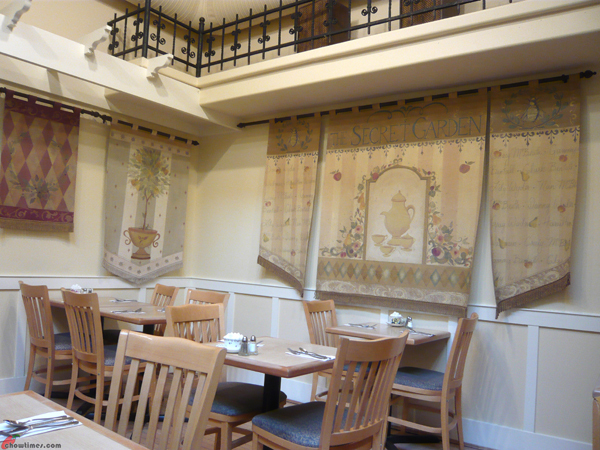 It is not very big; just a few tables. It only opens for breakfast and lunch. Tea seems to be the specialty here. So, Polly and I decided to have tea instead of coffee. Polly ordered the Raspberry Temptation. It is raspberry tea with chocolate. She had the regular size which is $2.85. The raspberry flavour does accentuate the tea.